It was mid noon as I strolled through a nondescript village in Basar, Arunachal Pradesh. When the rising mist slowly revealed the gorgeous green hills, I was encapsulated by one of the prettiest landscapes I had ever seen. The golden paddy fields and the lush green canopy in the foreground further accentuated the charm of the surreal landscape. Walking down a narrow lane, past small shrines, I was awestruck when I suddenly found myself in front of the magnificent edifice that stood facing the Narmada. While people around me happily posed and took photographs, all that I wanted to do was admire the magnificent outer façade of Ahilya fort. A peep through one of the arched windows of the fort revealed that life in Maheshwar revolves around the fort. While Narmada flowed languidly along the ghats, the local hawkers, priests, boatmen and guides were seen hustling around with their daily chores in and around the fort. Overlooking the Narmada, the Ahilya fort was built in mid 18th century by Holkars, who were a part of the Maratha empire and also the rulers of Indore. The fort is named after Ahilyabai Holkar, the Maratha queen who was responsible for the development of Indore and Masheshwar. A person with great administration and diplomatic skills, Ahilyabai made Maheshwar her capital and the royal residence was built inside the fort. Apart from the fort, Maheshwar is also known for a few popular temples which are located within the fort. A flight of steps from the Narmada ghats lead to the beautiful Ahilya fort, which has a bevy of arched windows, carved entrance door and intricate works. The fort walls stretch themselves on either side of the main entrance beyond the bastions. Inside the fort, the biggest attractions are its two temples and the cloister that offers lovely views of the ghats and the river. Akhileshwar temple dedicated to Shiva has a sandstone base and is at a height. The arches and dome have been exquisitely carved. The carvings of elephants and Maratha warriors on the outer façade of the base are absolutely magnificent. Opposite Akhileshwar temple steps lead up to Ahilyabai temple which is adorned with engraved pillars and sculpted mythological figurines. The temple offers nice views of the serene Narmada. Further up from the temples, a narrow road leads to REHWA society that works with the local weavers of Maheshwar. Maheshwari hand-loom sarees which are made here are quite popular for its fabric and reversible border. The palace of Ahilybai Holkar is referred as Rajwada and is located ahead of the temples. While a portion of this has been converted into a hotel, the other half is open to public. Lined with wooden pillars, this is where the queen lived and ruled. Presently it represents a museum with stories, history and collectibles of the royal family. Outside the palace is a huge statue of the queen, Ahilyabai Holkar. From the ghats, one can take a boat ride along the Narmada to soak in the serenity of the surroundings and for a panoramic view of the Ahilya fort. The fort is open from 7 AM TO 7 PM everyday. Avoid weekends if you would like to take photographs devoid of crowds. Maheshwar is 95 Kms from Indore, which has the nearest airport and major rail head. There are buses and taxis that ply between Indore and Maheshwar. Indore is well connected to other major cities across the country. There are a few cafes and restaurants in Maheshwar, apart from small eateries. The town also has many hotels and a couple of resorts which cater to all type of budgets. Spread over a well maintained garden, the renowned Buddhist stupas of Sanchi and the surroundings exhibited a serene influence all around. I was the first visitor for the day and had all the stupas, sculptures and carvings to myself. The unfinished monasteries and the monuments reminded me a lot of the heritage site at Sarnath. The sun had just begun to warm up and it was a pleasant walk amidst the Buddhist monuments of this UNESCO world heritage site. Though I was awed by the carvings and sculptures, what left me dumbfounded was the fact that these were built in the 3rd century BCE during Mauryan dynasty. It also means that a visit to Sanchi is a look back at monuments, carvings and stories which are more than two thousand years old. This also probably makes Sanchi one of the oldest Buddhist archaeological sites in the world. Ashoka, the Mauryan king who was a follower of Buddha and his teachings was instrumental in setting up this Buddhist site and Great Stupa (Maha Stupa/ stupa 1) in Sanchi. This hillock was chosen as the site as the surroundings were serene and apt for meditation. The large hemispherical stupas contain relics of some of the disciples of Buddha. It is widely believed that Ashoka had only built the Great Stupa and erected the Ashoka pillar, with four lion heads, similar to the one at Sarnath. The Great Stupa which is a hemispherical structure had many additions like outer covering, entrance gates, balusters etc. during various latter periods such as Shunga and Satavahana. The other stupas and monuments were also built during these periods between 2nd BCE and 1st BCE. Though Sanchi flourished as a centre for learning until the 11th century CE, it went into oblivion after the 14th century, only to be rediscovered by the British in 19th century. Sanchi site houses fifty Buddhist monuments spread across the hill. Maha Stupa or the Great Stupa (stupa 1) is one of the prominent structures in Indian architecture. This iconic monument has four entrance gates (toranas) which are embellished with extensive carvings and sculptures depicting stories from Buddhism, life of Buddha and Jataka tales. The railing with balustrade between the entrance gates and the stupa creates a circumambulatory path around the hemispherical edifice. The stupa was initially made of red bricks but later stone slabs were added to expand it to almost twice the original size during Shunga period. There is another railing with steps and a procession path that runs around the stupa. The railings have a few inscriptions on them and the circumambulatory path on the ground has four sculptures of Buddha. Atop the stupa is a small square railing with a parasol like structure. Stupa 2 is a short walk down the hill and is secluded away from the other stupas and monuments. Built during the Shunga period, this stupa has a railing with balustrade around it, but is devoid of any entrance gates. The balustrade has numerous motifs and inscriptions engraved on them depicting stories from Buddha’s life. Like stupa 1, this too has steps that leads up to another path around the Stupa, but does not have railings. It is believed that Alexander Cunningham, who is credited as the founder of the Archaeological Survey of India found numerous relics of Buddhist preachers inside this stupa in the 19th century. Another beautiful monument at this UNESCO world heritage site is stupa 3 which is located near stupa 1. The stupa which was built during Shunga period has an entrance gate with innumerable sculptures carved on it, which was added later during Satavahana period. The circumambulatory path is at a height and the railings have floral designs and carvings on them. Atop the stupa is a square railing with a parasol, similar to stupa 1. It is believed that this stupa held relics of Buddha’s two close disciples. Ashoka pillar or pillar no.10 is one of the most important structures at Sanchi, however, only the base remains as of now at the location. The polished monolithic column made from sandstone lies in a covered space nearby. The crowning lion capital (4 lions) is displayed at the museum near the entrance gate of the site. The archaeological site also houses a few other pillars that were erected during the Gupta dynasty. Only the column remains, and the crowns of all these pillars are exhibited at the museum. Another interesting structure is a large bowl carved out of a single stone that was used to store and distribute food to monks. As you walk around, one can spot numerous low brick structures which were supposedly monasteries, some of which were left unfinished. During the Gupta period a few temples were also built amidst the stupas and Buddhist shrines of Sanchi. Temple 17 is known for its symmetrical proportions and is devoid of much carving. It has a flat roofed sanctum and a portico with supporting pillars. Temple 18 which is believed to be an apsidal or semi circular shrine has just the base and pillars remaining. The tall pillars have designs on their upper parts and stand on the foundation of an earlier shrine from the Mauryan period. Located at a height, temple 40 is another shrine which had pillars and a platform. However, only the base of the pillars presently remains. Referred as Gupta temple, temple no. 45 is one of the prominent structures at this heritage site. It is both a temple and a monastery, and most of the structure does not exist apart from the base. Believed to have been built in the 7th century CE over an existing foundation, what remains are a few carvings of figurines, motifs, designs and a large sculpture of Buddha is a seated position. I was lost the whole morning in the world of Ashoka’s Mauryan empire, Buddhsit stupas, stories from Buddhism and brilliant sculptures from 3 rd century BCE. It was only when a busload of Srilankan Buddhist pilgrims arrived at the site, that it dawned upon me that I was time travelling at this UNESCO world heritage site. The Chaitya Vihar outside the site is run by the Mahabidhi society of Sri Lanka and has a collection of Buddhist memorabilia from 1st century BCE to 5th century CE. 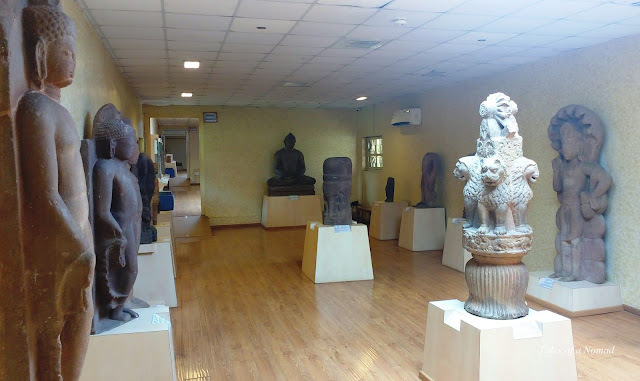 The museum at the base of the hill has a huge display of Buddhist sculptures from various centuries apart from the crowning Lion Capital of the Ashoka pillar. The site is open from 8:30 AM to 5.30 PM every day. The museum is open from 10 AM to 5 PM everyday. There is a shop within the premise which sells basic refreshments. Make Bhopal your base to visit Sanchi. There are numerous accommodation options across the city. It is advised to reach Sanchi by 8:30 AM to avoid the crowd and the harsh sun. Sanchi is 48 Kms from Bhopal. There is public transportation between Bhopal and Sanchi. One can also hire a taxi from Bhopal to reach Sanchi. Bhopal is well connected to other cities across India by flights and trains.